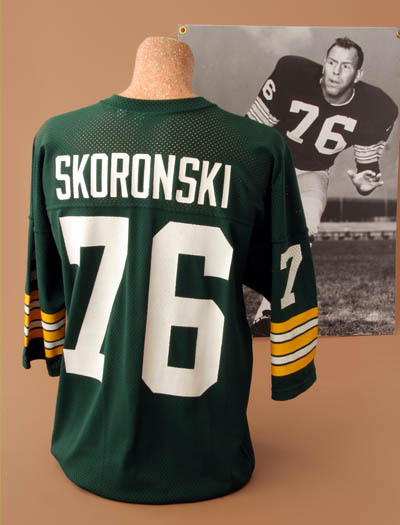 After lettering three years as an offensive lineman at Indiana University, where he never missed a game and served as team co-captain, Skoronski joined the Green Bay Packers in 1956. He played one season and then missed the next two while serving in the U. S. Air Force. 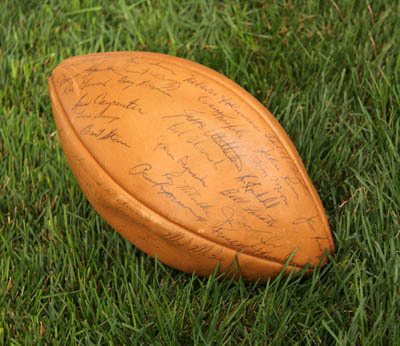 Upon his return to the pros, Coach Vince Lombardi immediately inserted him as the team’s starting left tackle. The 6-foot-3-inch, 250-pounder filled the position for the next decade and was the offensive team captain. 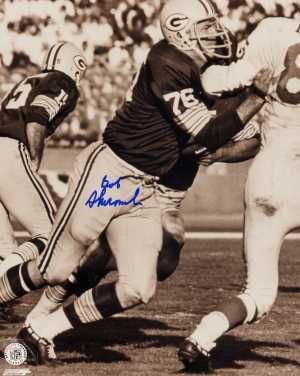 During Skoronski’s career, the Packers won five NFL championships and the first two Super Bowls ever played. After Green Bay won the first Super Bowl, he was named to the Pro Bowl squad. He has also been inducted into both the Indiana University Hall of Fame and the Green Bay Packers Hall of Fame. As a rule, offensive linemen are the least appreciated players on a football team. They do battle in the gridiron trenches so that the quarterbacks and running backs can grab the headlines. Just about the only time a TV announcer will mention the name of an offensive lineman is when he’s called for a penalty. The only real form of positive recognition most offensive linemen receive is being named to the Pro Bowl. Unfortunately, Bob Skoronski not only played on the offensive line, but he was usually overshadowed by some of his better known linemates when it came to Pro Bowl voting. However, there can be no doubt that Skoronski was a key force on Vince Lombardi’s Green Bay Packer championship teams of the 1960s. Skoronski’s parents worked in a rubber plant in Connecticut, but they encouraged their children to attend college. Bob went to Indiana University on a football scholarship, along with his older brother. Bob could have attended Notre Dame, but would only go to a college that offered his brother a scholarship as well. Bob’s two younger brothers went to Harvard, and his sister earned a doctorate. Bob earned a B.A. in marketing at IU and was also a force on the football field. The rugged offensive lineman was team co-captain, and never missed a game in college. As a senior he won a unique distinction for an offensive lineman, being named the Hoosiers’ Most Valuable Player. He played in the North-South All-Star Game in 1955 and the College All-Star Classic in 1956. Despite his fine collegiate career, Green Bay didn’t draft Skoronski until the 5th round of the 1956 NFL draft. He played right tackle as a rookie, and then went into the military for two years. When he returned to Green Bay, Lombardi had taken over as head coach. Bob became the team’s left tackle, a position he filled for the next 10 seasons. Lombardi helped turn around Green Bay’s fortunes by instilling the team with a new philosophy, demanding that the players make a whole-hearted commitment to winning. As offensive captain and a firm believer in Lombardi, Skoronski constantly reminded his teammates to approach their task with energy, pride and fierce determination. During Skoronski’s tenure the Packers won five NFL titles, including the first two Super Bowls ever played. That success was made possible by a running game that was spearheaded by the near-perfection of Skoronski and his linemates. 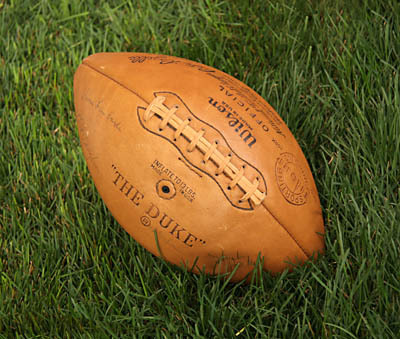 The Pack let the NFL in rushing years in 1961, ’62 and ’64. The 6-foot-3-inch, 250-pound Skoronski was an outstanding tackle, but he never seemed to receive many individual accolades. “Ski’s blocking grades were always among the best on the team, but he never got the recognition or the honors so many of us received,” recalled Kramer, a linemate of Skoronski’s. Bob wasn’t named to the Pro Bowl until 1967, when a victory in Super Bowl I capped one of his most productive seasons. Over the next 15 years Skoronski took Valley from a firm that employed 17 people and grossed a million dollars a year, to one that had more than 100 workers and an annual gross of over $16 million. Called a “super salesman, even when he was playing” by Kramer, Skoronski has been involved in a number of other successful business enterprises. Skoronski also was devoted to his family, raising four children with his wife, Ruth Ann. One son was an All-Ivy League defensive tackle at Yale, another went to Miami of Ohio on a football scholarship, another played basketball at Indiana, and his daughter graduated from Indiana University. Today, Bob is semi-retired, spending some time helping his sons but also doing a lot of hunting and fishing. He still enjoys getting together with his old teammates. “It was a great group of guys, a group with a high degree of intelligence, a group with a high degree of integrity that still stands,” he said. Bob was inducted into the Packer Hall of Fame in 1976, and into the Indiana University Athletic Hall of Fame in 1982 as a charter member. He now enters the Polish-American Sports Hall of Fame as a member of the Class of 2000.